Yet more capacity will soon be coming online between Australia and Singapore. The Indigo consortium announced today that it has completed the installation of both legs of the new cable system. 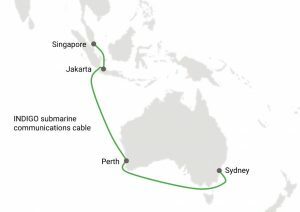 The Indigo cable stretches south from Singapore through Indonesia and along the west coast of Australia to Perth, and then along the southern coast over to Sydney. Each leg of the two-fiber-pair system spans some 4600km, and will support up to 36Tbps. It's a different route than most cable systems have taken to the markets down under, and brings needed diversity to the region. The actual RFS date is still ahead, but is expected to be before the end of Q1. The consortium includes AARNet, Google, Indosat Ooredoo, Singtel, SubPartners, and Telstra. SubPartners was bought a couple years ago by Superloop, which joined the project then as well.